For over 30 years, Door County Confectionery has been treating its customers to mouth-watering chocolates and delicious fudge hand-made in Door County, Wisconsin. 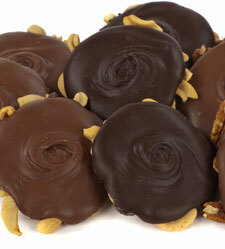 Now Door County Confectionery offers you all our special treats and gifts in a secure online shopping environment. To get started, use the links above to view our products. The first Door County Confectionery was established in the quaint vacation village of Fish Creek, Wisconsin in 1972. Through the years, we have grown to many locations in the Chicago and Milwaukee areas. You can see all of our very special chocolates hand-made at our Confectionery in downtown Sturgeon Bay. This first Confectionery store, nestled between the rocky bluffs and cool waters of Green Bay, has become a traditional attraction for vacationers. What makes Door County Confectionery the best? There are so many places you could go to buy confections. We've gone to extraordinary efforts to ensure that Door County Confectionery is your best choice. The quality begins with our selection of ingredients. Door County Confectionery's standards for chocolates are never compromised. We only use the freshest quality ingredients. Over 30 years of chocolate making experience coupled with our loyal customer base make Door County Confectionery what it is today.